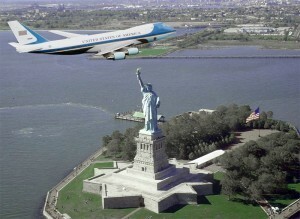 NEW YORK (CBS) – A furious President Barack Obama ordered an internal review of Monday’s low-flying photo op over the Statue of Liberty. Seriously, what other “photo op” except an adventure film could this have been for. And if the theory is right, was it worth scaring New Yorkers? How much did we pay for this Obama promotion–because surely the film will end with him flying victoriously in that plane followed by a fighter plane from Alabama? The Narcissus president, having just canceled the F-22, doesn’t believe in jet fighters for the national defense, but evidently does for photo-ops. Contact New York’s senior senator and tell him you demand some honest answers.